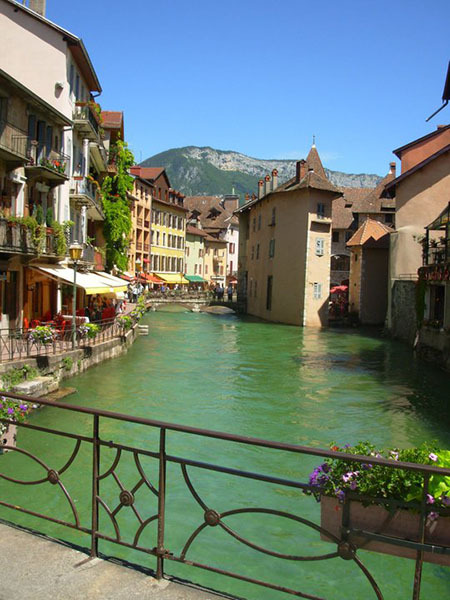 Learn French in Annecy, a beautiful French city situated in the Rhône-Alpes region of eastern-central France. The city is positioned on the shores of the wonderful Lake Annecy 22 miles south of Geneva and has a population of a little more than 50,000 inhabitants. Due to the city being located in between Geneva and Chambery. Annecy's beautiful lake is of great interest to vistors, who flock to the lake each summer to relax, swim and enjoy sailing. With the lake being backed by the Alps it is visually very beautiful and is a very peaceful place during much of the year. Some of the most popular ski resorts are within drivng distance. These include hiking, mountain biking and climbing, and sailing and waterskiing on the lake. Switzerland and Italy are also located close-by and are ideal weekend exursions for you to take if you choose to learn French in Annecy.